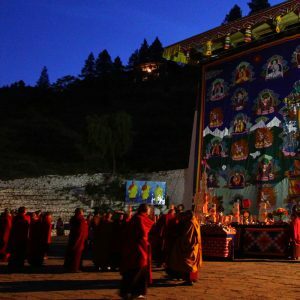 Gangtey Tshechu is a festival that is celebrated to commemorate the great deeds of 8th century Tantric master Guru Padmasambhava who introduced Buddhism in Bhutan. Adorned with colorful costumes, the dances are performed with outstanding energy and locals gather to witness in their finest clothes. You will be received at the exit gate of the airport by your guide. After a short welcome tea, visit Rinpung Dzong situated at a commanding height overlooking Paro valley. Built by Shabdrung Ngawang Namgyal in 1646, this dzong now houses monk body and the offices of the civil administration. Next, visit Ta Dzong, the ancient watchtower and now the National Museum which houses the collection of ancient Bhutanese art and artifacts, weapons, coins and stamps. After lunch, visit 7th century Kyichu Lhakang, one of 108 lhakhangs constructed by Buddhist Tibetan King Songtsen Gampo. This temple is one of the oldest and considered to be very holy and holds great significance in Bhutanese history. On the way to Thimphu, a quick visit to Tachogang Lhakhang (literally, temple of the excellent horse) built by Tibetan monk Thangtong Gyalpo in 15th century. It is situated on a hillock across an iron bridge constructed in a traditional style. 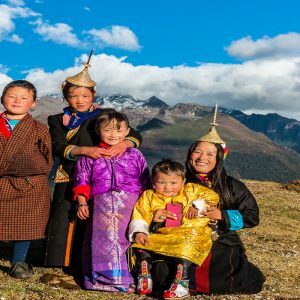 Further, drive to Thimphu, 40 miles north-east from Paro, about 1 hour and 20 minutes’ drive alongside the river with awesome views of narrow valleys, mountain ridges and hill slopes. Check-in the hotel and come out to stroll around the town. You can see modern buildings ornamented by traditional architect, people in traditional dresses and graceful gestures of a policeman controlling the traffic. On second day morning, after the breakfast, we will drive up to see 169 feet (51.4 meters) tall statue of Shakyamuni Buddha called the Dordenma. Although this bronze statue gilded in gold is still under construction, it is open to tourists and safe to visit. On return, you will enjoy taking pictures of spectacular Thimphu valley with a panoramic view of the city. Next, visit Mothithang Taking Preserve, a park in Motithang to see the national animal of Bhutan Takin which is supposed to be found only in eastern Himalayas. On way back drop by Zilukha Nunnery to meet Bhutanese anims(nuns) and understand about their daily lives. 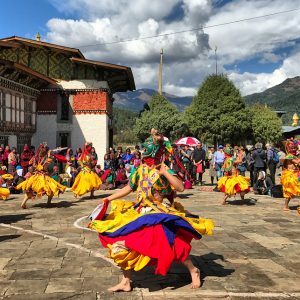 Then visit the school for Bhutanese traditional arts and crafts, the Institute of Zorig Chusum (the 13 crafts) to see the display of their works and also witness their lessons on followed by National Library to see the collection of old manuscripts. Then visit a 12th century monastery called Changangkha Lhakhang believed to be the residence of the protective deity Tamdrin. All new born babies get their names from here. Visit National Memorial Chorten (temple) built in memory of our third king of Bhutan who passed away in 1972. Enjoy the scene of locals circumambulating the chorten religiously and have a look at intricate Bhutanese designs and paintings. Next visit is Jungshi paper manufacturing unit where handmade authentic Bhutanese paper called Desho is produced involving indigenous method. In the evening, visit Tashichhodzong, enjoy the beautiful exhibition of ancient Bhutanese architecture. Although it was originally constructed as early as 13th Century, it was renovated several times until 1952. Back to the hotel. And if you are not tired explore through the town and visit temporary stores of traditional crafts queued along the road. After 45 minutes’ drive uphill from Thimphu, stop at Dochula, a mountain pass at 3100 meters, from where on a clear day you can capture incredible view of distant snowcapped Himalayan mountain ranges. 108 Druk Wangyal miniature chortens (temples) maintain the serenity of the place. Then, we descend down the mountains through meandering roads and myriads of colorful rhododendron shrubs that bloom in the month of April and May. Once we reach the warm and fertile valleys of Wangdue, we will take lunch in one of the restaurants and drive up to Gangtey/Phobjikha towards the east of Wangdue on the flanks of the Black Mountains. Crossing a 17th century old Gangtey Gompa (monastery), few kilometers down the valley is a fascinating valley of Phobjikha. Here is the winter home of rare migratory black necked cranes that fly from the arid plains of Tibet in the north. Anyone would be enraptured admiring at the astonishing landscape formed by receding glaciers once upon a time. Take a stroll and capture some pictures and breathe the freshness of air from pristine nature. Overnight at a farm house in Phobjikha. Attend Gangtey Tshechu in Gangtey Monastery. 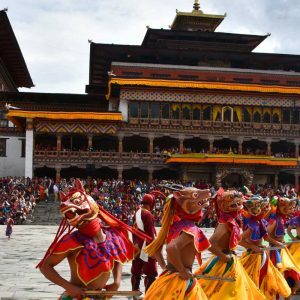 This festival is celebrated to commemorate the great deeds of 8th century Tantric master Guru Padmasambhava who brought Mahayana Buddhism in Bhutan. Tshechus are dominated by ancient religious Mask Dances performed by both monks and villagers who are well trained. Adorned with extremely brilliant costumes they imitate the legendary events with outstanding energetic dances accompanied by blaring horns, booming drums, and clashing cymbals as they whirl and leap around the courtyard of the monastery. It is customary for people from around the valley to gather in their finest hand woven bright dresses to witness the festival. Locals believe that attending Tshechu once a year fetches them blessings by pleasing the deities which in return bring them merit, luck and prosperity. These festivals are blessed with indefinite virtues and prayers: a mere visit cleanses one of sins, fulfils wishes and guides the path to Nirvana (Liberation from the cycle of existence). After breakfast drive Punakha which is approximately 4 hrs. From Gangtey the road gradually descends into the gentle valleys of Wangdue and enters Punakha. 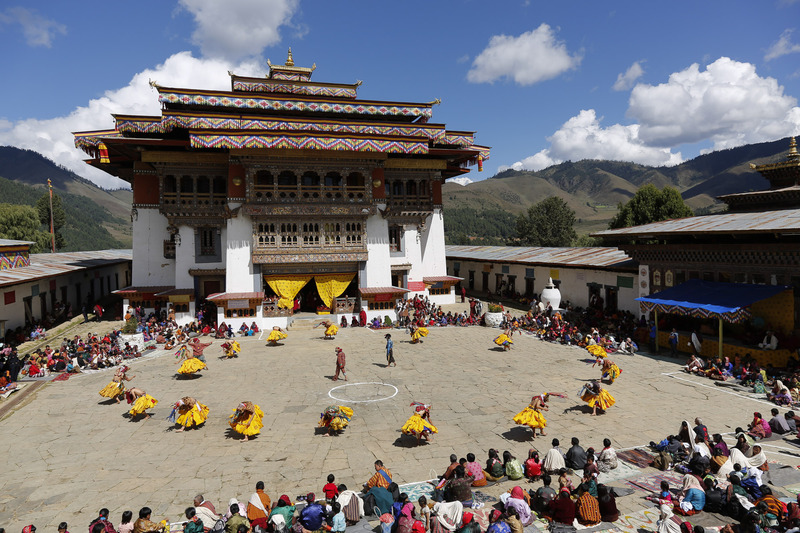 Punakha had remained as the old capital of Bhutan until it moved to Thimphu in 1955. In the afternoon, visit Chhimi Lhakhang (temple) the temple of fertility situated on a spherical hillock built in 1499. Walk about 15 minutes through a village and paddy fields. There is an interesting history behind this sacred place about Drukpa Kuenley whose crazy wisdom of teaching Buddhism through sexual references using wooden Phallus as one of the symbols for driving away evils, because of which he is commonly referred as ‘The Divine Madman’. Next, visit Punakha Dzong, one of the most beautiful and majestic dzongs built by Zhabdrung Ngawang Namgyal in 1637 at the confluence of two significant rivers; Pho chu (male) and Mo chu (female). This Dzong holds a great significance in history of Bhutan.Although four catastrophic fires and an earthquake in past times destroyed many historic documents, Punakha Dzong still houses many sacred and historic artifacts and also the embalmed body of Shabdrung Ngawang Namgyal . After breakfast, a short hike of about 30 minutes up to Khamsum Yulley Namgyel chorten built by Her Majesty the Queen Mother Ashi Tshering Yangdon Wangchuk in over eight years’ time. Enjoy the scene of spectacular valley downhill with a thin line of meandering river. In Paro, visit to a historic site of a ruined Drugyel Dzong approximately 9 miles towards north built somewhere in 1647 to commemorate victory of Drukpas (Bhutanese) over Tibetans. Unfortunately, in 1951 it caught fire and raged to ground leaving behind the collapsed walls outlining this historic site. No visitors leave Bhutan without hiking to Taktshang in Paro. Built in 1692, Taktsang literally means ‘Tiger’s Nest’ is perched amazingly on a rocky cliff above 900 meters above the valley. It is believed to be the cave where Guru Rinpoche, the whisperer of Buddhism in Bhutan, flew on a tigress’s back and meditated for years to subdue evil demons. The hike of 2 to 3 hours uphill by the winding trail through pine forest to the monastery is irresistibly gratifying. The view of incredible grandeur of the structure clinging on a cliff will leave a lasting impression of your journey to Bhutan. On return, take lunch in the cafeteria.Last shopping in some handicraft shops in Paro town. After breakfast in the hotel, drive to the airport to your onward destination.